The exterior of the new library will have the look of 1960s dealerships and gas stations. An automotive-themed library in Windsor, Ont., is under construction and will be named after one of the city’s most prominent auto dealers. The new $2.6 million library, located at the Optimist Community Centre in the city’s core, will be named the W.F. Chisholm Branch, after the well-respected local automotive executive and founder of Rose City Ford Sales Ltd.
Windsor Public Library CEO Kitty Pope says the naming of the new branch is a fitting tribute to Chisholm. 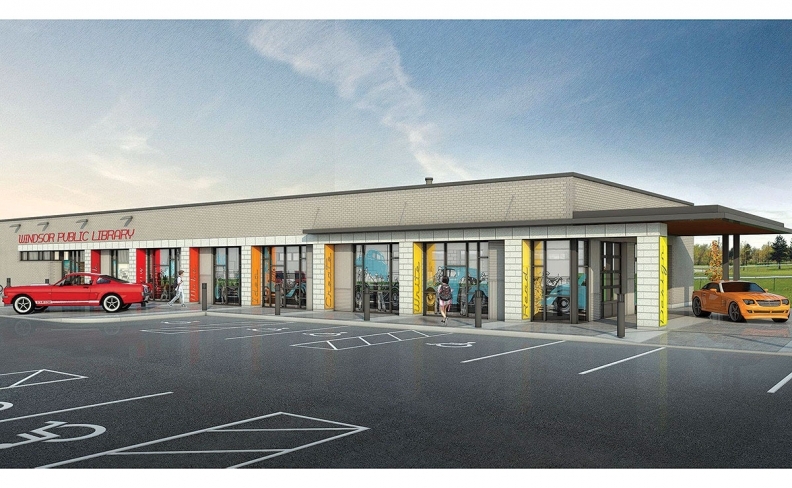 The exterior will combine the looks of 1960s dealerships and gas stations. Inside, the library will house the Automotive Archives, a collection of 4,600 volumes of material about the auto industry. Rare memorabilia and a collection of original design sketches by what the library has only identified so far as “a leading car designer” will decorate the space. Chisholm moved to Windsor with his family at age 10, in 1942. His first full-time auto job came in 1955 when he was hired as a brake tester on a Chrysler assembly line in Windsor. At age 41, Chisholm resigned from Chrysler to pursue his dream of operating a car dealership. After stints as general manager at a couple of central Ontario dealerships, he moved his family back home to Windsor. In 1981, when interest rates were high and many automotive dealerships were struggling, Chisholm bought a Ford franchise in Windsor and named it Rose City Ford Sales Ltd. Chisholm’s final sale came in 1996, when he decided to retire with his wife Amelia and sell the dealership to his son John. Today, at 85, Bill plays golf and travels.